Ahd Alaraj graduated with distinction from the German Language Program at Birzeit University in 2018. Nearly a year later, she is still going to the same classes she took as a student. Now, however, she’s the teacher. Alaraj’s journey at Birzeit University began not in the German language bachelor’s program, but in the Doctor of Pharmacy Program. She enrolled in the program and began studying earnestly, but as the days went by, she found that the results she was getting were not equal to the effort she was investing - academically or emotionally. “The high school I graduated from - the Talitha Kumi School in Beit Jala - allowed us to choose between taking the national Palestinian curriculum, which leads to a Palestinian high-school degree, or an international program that leads to the German International Abitur - the German equivalent of a high-school degree. I chose the international program, and thus began my passion for the German language,” Alaraj said. While Alaraj managed her doctor of pharmacy classes, she knew that there was a program in which she could do better - a program in which she could unleash her full creativity. That program was the German Language Program, but at that time, it was only an idea. “I wanted to enroll in some extracurricular activities that involved the German language - I didn’t want to lose my grasp of the language - so I went to the DAAD offices on campus and asked around. As it turns out, they were in the final stages of establishing a German language program that would lead to a bachelor’s degree,” Alaraj recalled. Alaraj transferred to the German program when it was fully established and, due to its flexibility, she was able to skip some modules that she had completed during her high-school studies. In 2017, Alaraj graduated with honors from the program, a full year before her classmates, due to her previous studies in German and outstanding abilities. And when the program was short on instructors, they were confident that she would be able to lead the classes she took as a student. 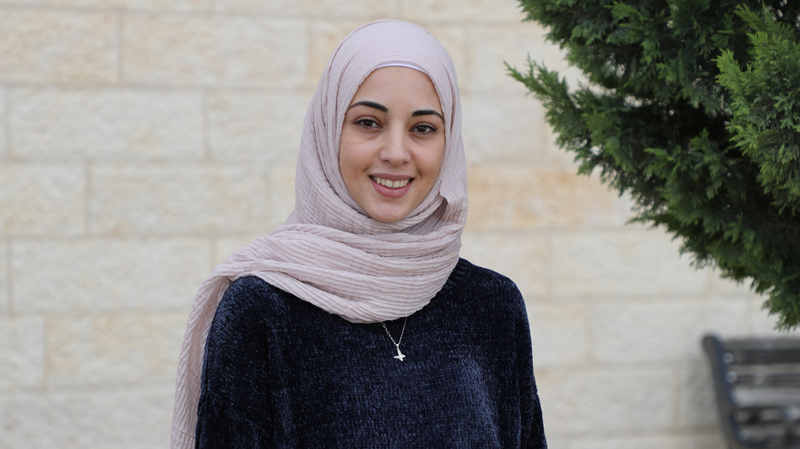 At 24 years old, Alaraj is one of the youngest instructors at Birzeit University, and one of the closest to her students. “When the students enter a classroom, they expect an instructor or a professor who is at least 10 years older than them, not a year or two, and that changes the classroom dynamic,” she commented. But instead of doubling down on her authority as an instructor, Alaraj used her experiences as a student in the program to get closer to the students. When discussing a complex concept, Alaraj tells the students what she thought was difficult when she herself came across that concept as a student, and shares how she deconstructed and connected it to the overarching principle. “Learning a foreign language is difficult - and even more so in the case of the German language - so I simplify the difficult concepts as much as I could and tell the students what I did when I was in their shoes to understand the concepts,” Alaraj noted, explaining how she addresses difficult lessons and concepts as an instructor. As for how she was able to master a foreign language and teach it in an undergraduate program at the university, Alaraj said that the key was in immersion. “If I had to give one piece of advice to students, it would be this: The key to language is practice, and practice makes perfect. Immerse yourself in the language you want to learn, and remember that languages are the pathways to interesting and colorful cultures and perspectives,” she added.